Place a pan over medium high heat. Add 1 tsp of oil, then once the oil glistens, add in the onion, jalapeno, and garlic. Stir to avoid burning the garlic, then add in the ground beef after 2 minutes. Break up the beef with a spatula or back of the spoon and cook until completely browned. 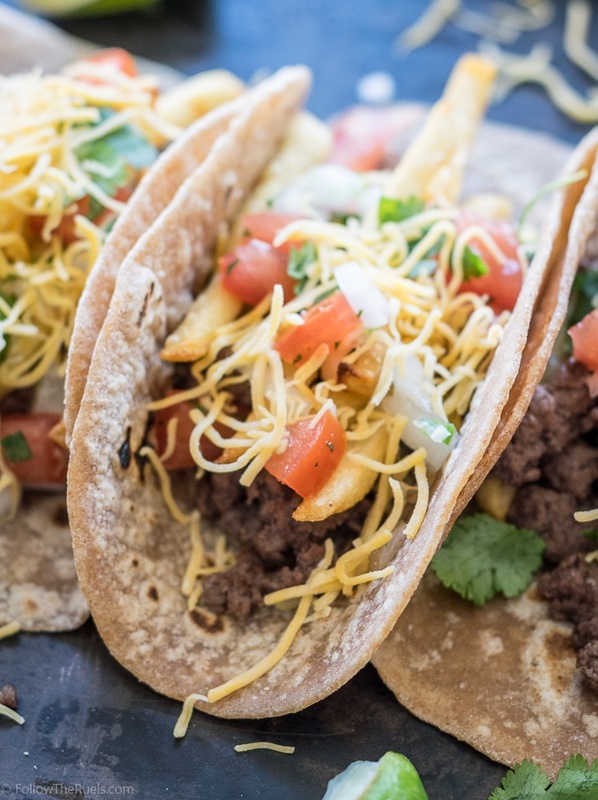 Season with salt and pepper to taste and squeeze the juice of the lime over top..
Once meat has browned, assemble the tacos by spooning 2 -3 tbsp of the ground beef into the center of a tortilla. Top with french fries, pico de gallo, and other toppings of choice. Serve while warm.